It’s the second last week of September; the lights at the WFCU Centre have been turned on, jerseys are hung in their stalls and the nets have been removed from storage. Hockey is officially back and the 2018-19 Windsor Spitfires are ready to take the next step in their development. Just nine months ago, general manager Warren Rychel set out to rebuild the roster. They were coming off of a 2017 Mastercard Memorial Cup win on home ice but knew that assets were few-and-far-between. The only choice was to trade off veterans and bring in a youth movement. 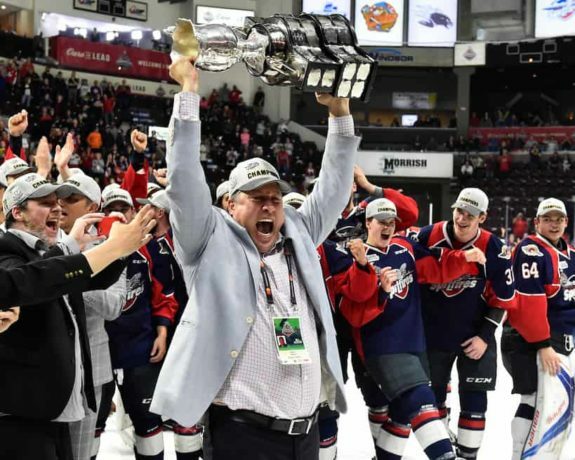 Rychel made several deals and the result was the sixth-seed in the Western Conference before bowing out to the Sarnia Sting in the first round. As they come into the 2018-19 season, the youngsters are a year older and the playing time will only benefit them. Rychel has a solid core of veterans, too, who will act as mentors as the team tries to take the next step towards a championship run. 2. Jake Smith – 59 games 20 goals 28 assists 48 points. – Playoffs – Lost to Sarnia 4-2 in Round One. The Spitfires lose a handful of veterans but gain plenty of talent at the same time. Last season, the Spitfires scored the fourth-fewest goals in the OHL (214). While there were games where the offence couldn’t be touched, other nights saw the team fail to even reach the net much of the time. It’s not easy for anyone, but it’s part of the world of rebuilding. Rychel dealt key veterans at the deadline, bringing in youth in hopes for making a run by 2020. In the off-season, he made sure to stockpile the offence, too. They’re a team that’s a little green but they have the potential to turn the red light on. Up front, the Spitfires have two youngsters who are going to make a name for themselves in the near future – Jean-Luc Foudy and Will Cuylle. 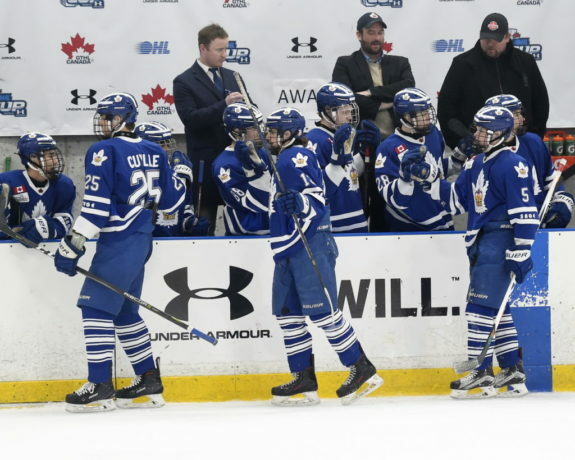 Foudy was the Spitfires’ first-round pick at the 2018 OHL Draft, while Cuylle was selected third-overall by the Petes. Cuylle repeatedly said he wouldn’t report to the Petes, so they dealt him to the Spitfires in August for a several draft picks. Foudy and Cuylle join youngsters Cody Morgan, Jordan Frasca and Daniel D’Amico on a youthful forward group. The group won’t have to do this alone, though, as some wily veterans are there to make their mark. Dallas Stars’ prospect Curtis Douglas, who clocks in at six-foot-nine 250-pounds, will likely have a say in how games play out. He’ll be alongside popular veterans Luke Boka, known for his never-say-die attitude, and Cole Purboo, who led the team in scoring last season. On Wednesday afternoon, the Spitfires named Boka as this season’s captain, while Purboo and 18-year-old Chris Playfair will serve as the Alternates. Playfair really came into his own at the end of last season and showed signs of a solid two-way game. Head coach Trevor Letowski told the Spitfires’ website that Boka’s overall approach is what sets him apart. “We feel like Luke has really grown each year he’s been here, both on and off the ice,” Letowski said. 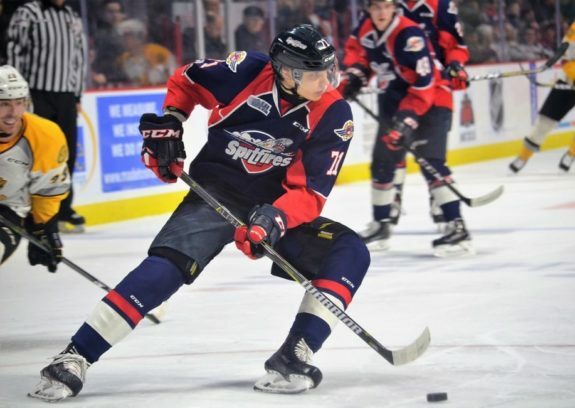 The Spitfires also have two overage forwards who are ready to teach – Luke Kutkevicius and Igor Larionov. While they had some injury issues last season, both are top-six players and will be counted on for their wise-beyond-their-years knowledge. While the group wasn’t the most offensive, it was more from a lack of experience than anything. With that year under their belt, plus the addition of offensive weapons, this offence could be night-and-day compared to last season. It’s not every season that a team can return almost their entire defensive group. That’s what the Spitfires plan to do, though. With only Shankar leaving, the team welcomes back the majority of their top-notch defence. They allowed the fifth-fewest goals in the Western Conference (224) and have become a source of pride for the organization. With the departure of Shankar, the Spitfires were left without a true older presence. Rychel went out this week and acquired 20-year-old Sean Allen from the Generals. Allen has one goal in 150 OHL games but his 297 penalty minutes, and reputation for being one of the toughest in the league, are more than fine with this roster. The six-foot-three 200-pound stay-at-home defenceman will provide that toughness the team needs while teaching the youth how to play the OHL game. Allen joins veterans Connor Corcoran, Thomas Stevenson, Lev Starikov, Nathan Staios, Grayson Ladd and Louka Henault on the blueline. The Spitfires’ also have Dylan Robinson, who was their third-round pick in 2018, and he’ll likely see time between the OHL and Jr. B. The defence is young but having a full year under their belt is a big plus. The motto of this group could be “Hakuna Matata” because fans should have no worries as the season goes along. The team has a defence-first philosophy and it’s worked. King of Crease or Protégé? This should be simple – star goaltender Michael DiPietro takes his rightful spot on his blue throne. There’s a catch, though, and it’s the million dollar question – will DiPietro be a Spitfire for much longer? Last season, there was plenty of talk of DiPietro getting moved before the deadline. It didn’t happen, though, and he was a big reason the Spitfires finished in sixth place despite a rebuild. That’s not the story now, though. With this likely being DiPietro’s last season before moving onto the Vancouver Canucks’ farm system, how likely is it that he stays with the team all season? Best guess is slim-to-none. So, when does he get dealt – now or at the deadline? He will fetch several high-end draft picks plus a top young talent but there are plenty of moving parts in this. It might be the biggest question mark with the Spitfires in the last several seasons. However, should DiPietro get dealt, the Spitfires have a solid replacement – Finnish goaltender Kari Piiroinen. The team took him during the CHL Import Draft in June and he’s primed for a big NHL draft season. The 17-year-old out of HIFK Helsinki is new to Canada but has already impressed during training camp and the pre-season. Should DiPietro go sooner, rather than later, Piiroinen will take the coveted crease spot. Who would back-up Piiroinen? That’s to be determined. The Spitfires’ did recall veteran Lucas Patton from Jr. B. while DiPietro is with the Canucks’ camp, but it’s unlikely that Patton plays the backup role as a 19-year-old. Regardless of how this plays out, the Spitfires are set in net for both the short-and-long terms. After finishing in the sixth-seed last season, the Spitfires are ready to take that next step. While the DiPietro situation has to be sorted out, there’s little doubt that getting home-ice in the first round, and getting a playoff series win, is the goal. The team hasn’t won a playoff round since 2010-11 and fans are getting restless. This should be the group to do it, though. With players like Cuylle, Foudy, Boka and Douglas up front, plus a stingy defence behind them, this is a cohesive group that is eager to show the City of Windsor, and the rest of the OHL, that they are for real. Plus, it’s no secret that Rychel will make moves to bolster the roster when necessary. Don’t expect a championship run this season but trust in management. This team could make some real noise if everything comes together. You can check out the Spitfires’ schedule by clicking here, plus get tickets to Thursday’s home opener against the Guelph Storm, and the rest of the regular season, by checking out their ticket website. Thursday’s game is set for 7:05 p.m. at the WFCU Centre.